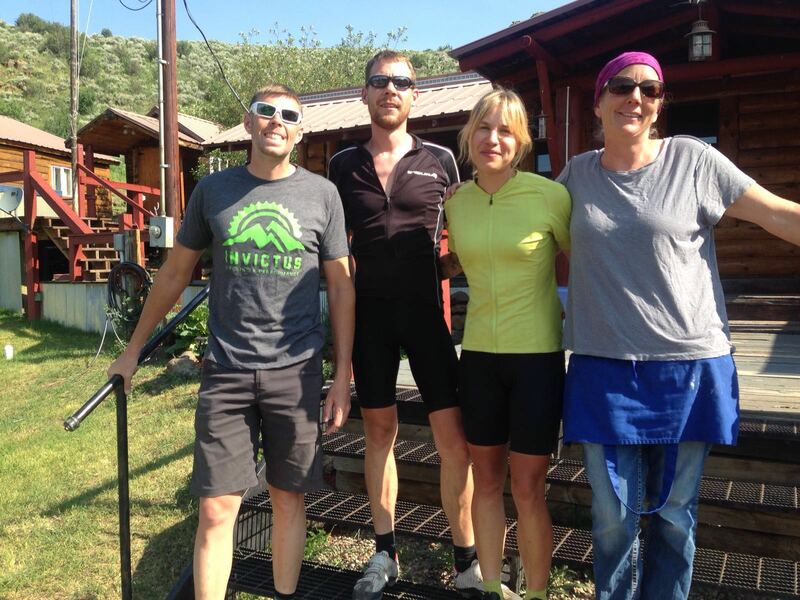 After our relaxing day off in Vail, my friend Sean dropped us off back on the route at Silverthorne. We had another substantial breakfast at the Mountain Lyon Cafe before saying goodbye and heading back off into the mountains. Climbing out of Silverthorne had a fantastic view of the still snow capped mountains, which kept us in good spirits as we ascended back up to nearly 10,000 feet at Ute Pass. 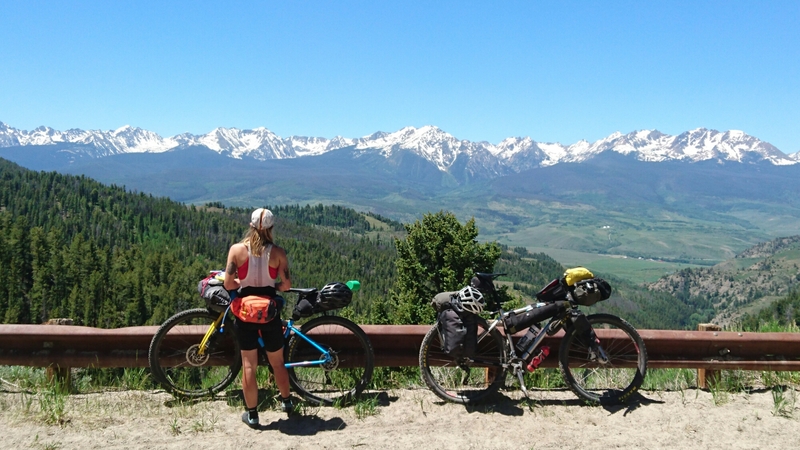 We had been checking the progress of the Tour Divide race, which follows the same route but with most participants heading south after leaving Banff on 10th June. 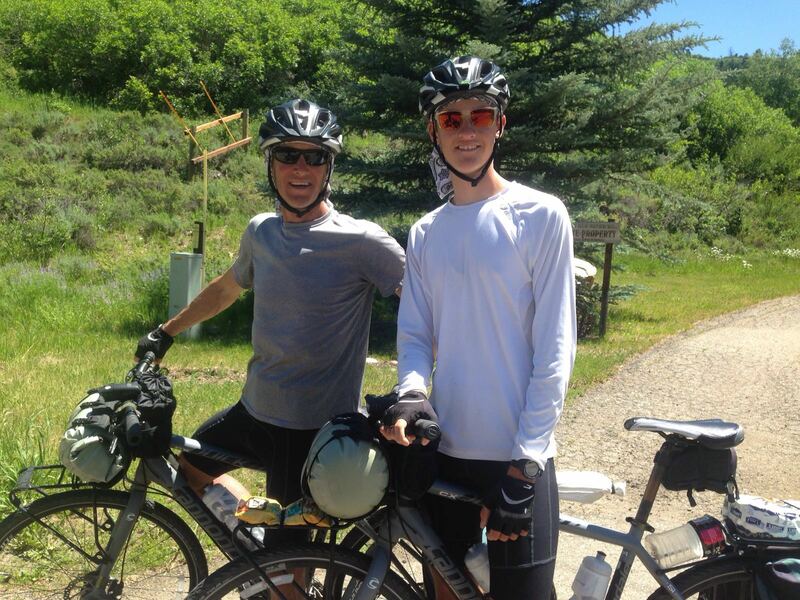 30 miles out of Silverthorne we passed Mike Hall, previous winner, current leader and well known endurance racer. We had a quick chat before letting him crack on with his target of 13 days to compete the 2800 mile route! 5 minutes later we passed another rider, probably the most well known person to attempt the route, motorbike racer and TV personality Guy Martin! Internet rumors seemed inconclusive as to whether Guy was actually riding, as he was using the pseudonym Terry Smith, but he was definitely present when we stopped for another chat and exchanged info on the terrain ahead. There’s been various talk online about his reasons for doing the ride, and why the secrecy, but he was out on his own, putting in a good time, and I get the feeling he just wanted to ride, for himself, without any media attention. If a TV series comes out later in the year my view may change! Just after passing Kremmling we spotted our first bear, though it was a fair way off and didn’t want to hang around, glad we had just bought some pepper spray back in Vail! 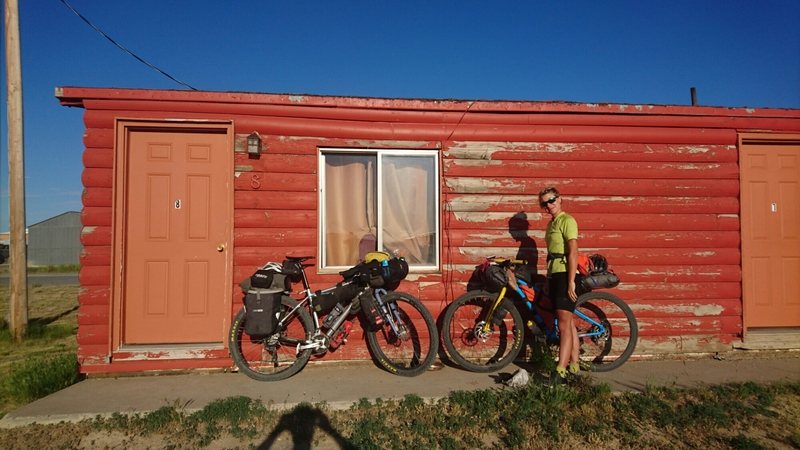 We carried on for 65 miles before stopping for the night at Pumphouse campground, on the Colorado river which provided a nice, if a little chilly, wash before settling down for the night. The campground was a bit busy but the kind lady in the Caravan next door gave us a couple of cold ciders which were very welcome after a hot day on the bike. 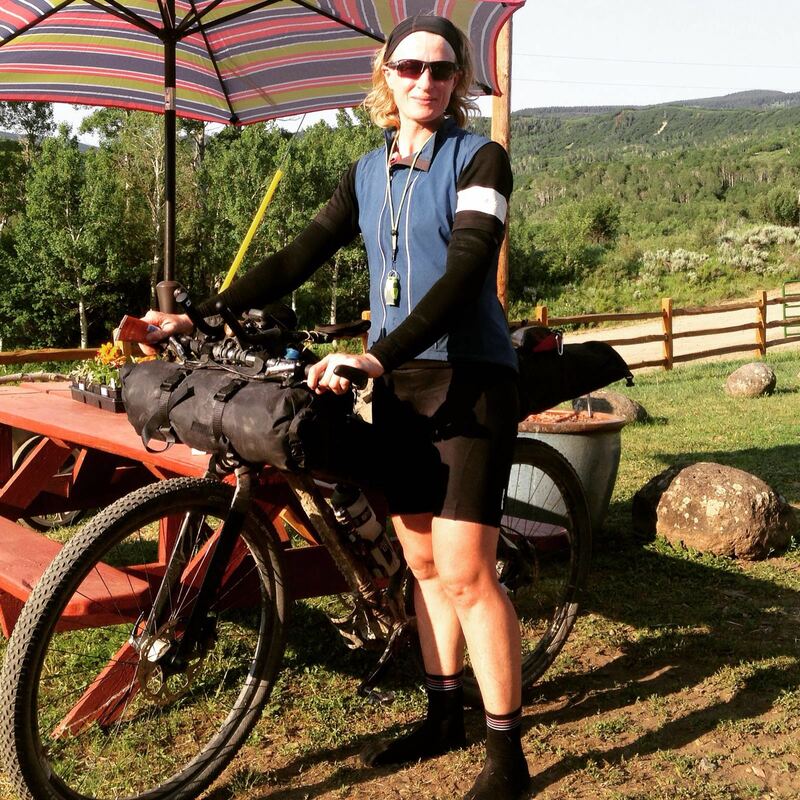 The following day we set off towards Radium, battling the mosquitos for the first few miles of climbing, when we soon passed Chris Plesko, 2nd placed rider in the TD race. 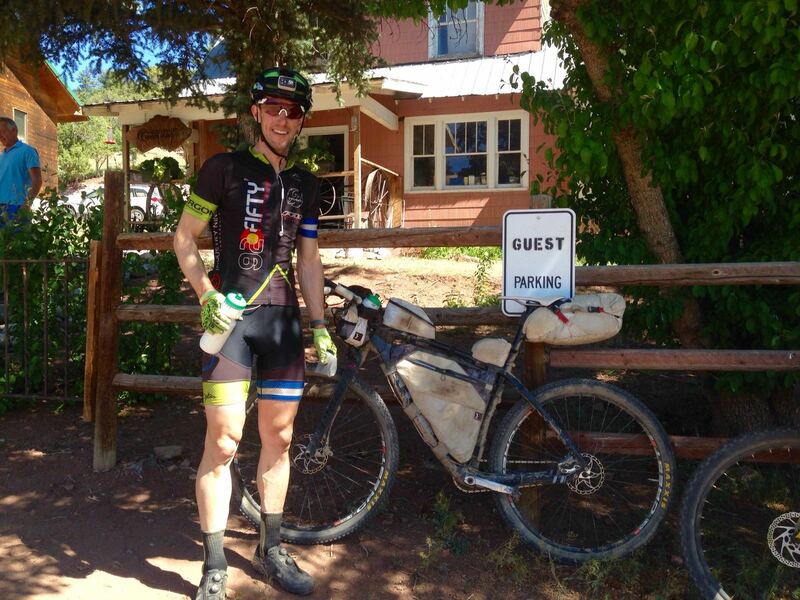 Chris is riding a single speed bike, with a 32/16 ratio, and still covering around 200 miles a day! I’ve ridden a single speed road bike a fair bit, but riding up 3500 meter mountain passes without gears, and at that pace, is quite staggering. He was great to chat to as we ate ice cream in the small store at Radium. I’d had my usual look the night before at what to expect gradient and mileage wise, and somehow I wasn’t expecting anything too taxing. The climb out of Radium however, seemed to go on and on, and I must admit feeling pretty broken after a couple of miles. I was questioning why we were doing the ride as the heat, mosquitos, and the never ending winching my bike up hill started getting to me. Of course we did eventually start pointing down and I pulled myself together to put in another 65miles to get to Steamboat Springs. The name may not suggest it, but Steamboat is a big Ski resort, and as such there were plenty of out of season deals in the hotels. Bizarrely the cheapest we could find was the Steamboat Grand, 4* and for less than a Travelodge in London we had a suite bigger than our cottage back in Sussex! Relaxed and well fed after our stay in The Grand, we headed out of town on our 22nd day on the Divide. Soon after we bumped into ‘Chili and Pepper’, the trail names of the father/son pair that we met back in Pie Town a week before. It was good to catch up and share experiences, and I hope we’ll see them again before the end! After spotting some more wildlife, Beavers this time, we headed over Watershed Divide, one of the most challenging rocky sections so far. I quite enjoy the challenge as it breaks up the monotony compared to smoother surfaced passes, but there was no question it was a tough day, with us ending up back in snow at the top. We finished the day 53 hard miles in at Brush Mountain Lodge, which felt similar to the Toaster House in Pie Town, but with a host this time. 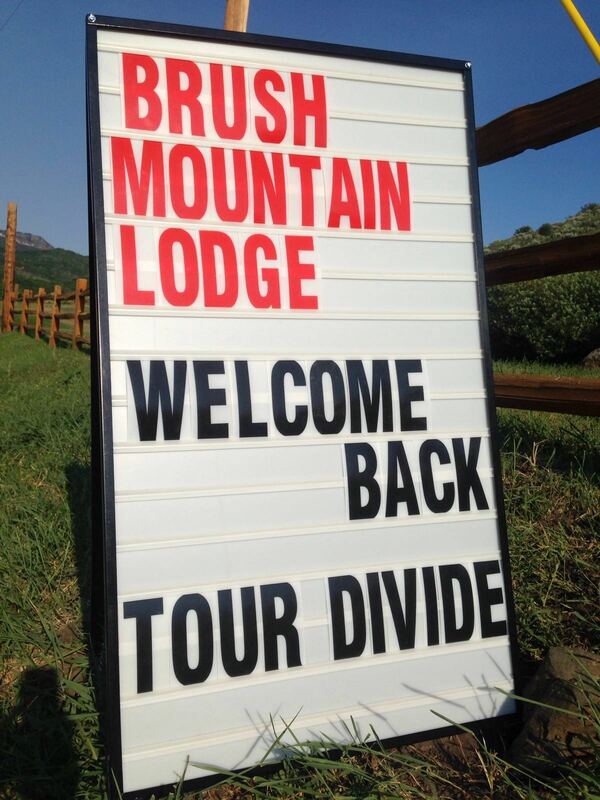 Originally a hunting lodge, Kirsten welcomes TD riders over the summer and it was perfect! We were offered pizza and watermelon on arrival, and chatting to the other riders with a cold beer was a great end to the day. Thanks again Kirsten, and remember to get in touch if you’re ever in the UK! Also present were Billy Rice, on the left above, a well known coach and yo-yo Divider (completing the route out and back, over 5000 miles, once with his daughter on a tandem! ), and also Jackie Bernardi, the current female leader of the TD race. Leaving Brush Mountain Lodge felt a shame, but we needed to press on, and the first 50 miles of the day, were quite literally a breeze. With a nice tail wind carrying us out of the Colorado mountains and into the plains of Wyoming, we felt great to be making good pace. After a quick lunch stop of ice cream sandwiches (why don’t we get these back home?) we turned onto gravel, and unfortunately, into the wind. Our speed dropped from 15-20 mph, down to barely 6 mph as we battled along, big trucks showering us with dirt every few minutes and the afternoon heat taking hold. What followed was probably the hardest part of the trip so far. 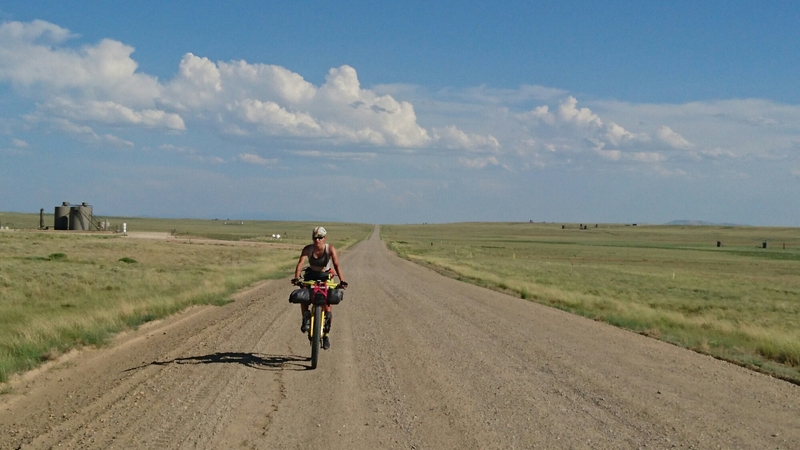 After the luxurys of Colorado we found ourselves on a dead straight gravel track, which it became clear was mainly a service road for the oilfield we were riding through. The scenery was barren and unchanging, the road surface was washboarded and though mainly flat the headwind was relentless. It took us at least 4 hours to cover the remaining 30 miles, and after 80 for day we were truly exhausted. Entering Wamsutter was hardly a relief, a run down industrial town appearing to exist solely to service the oilfield and the truckers. Still, a shaby motel and some Mexican food later, and things aren’t looking so bad. 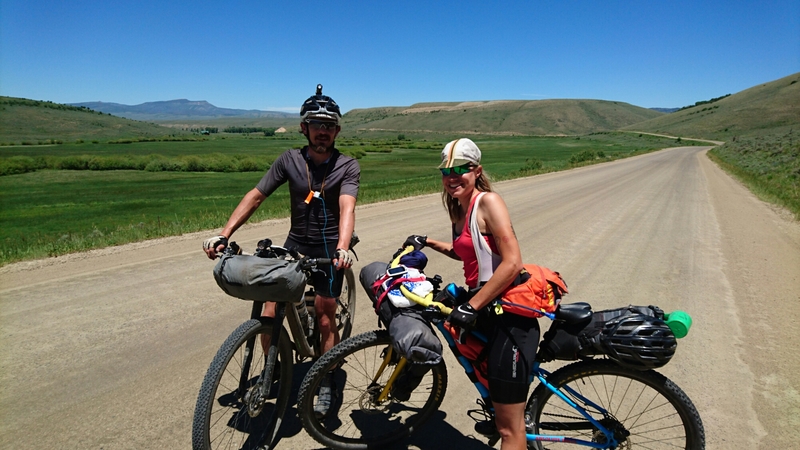 After 23 days on the Great Divide, we’ve now covered half the distance, around 1400 miles and are making good time towards Banff. 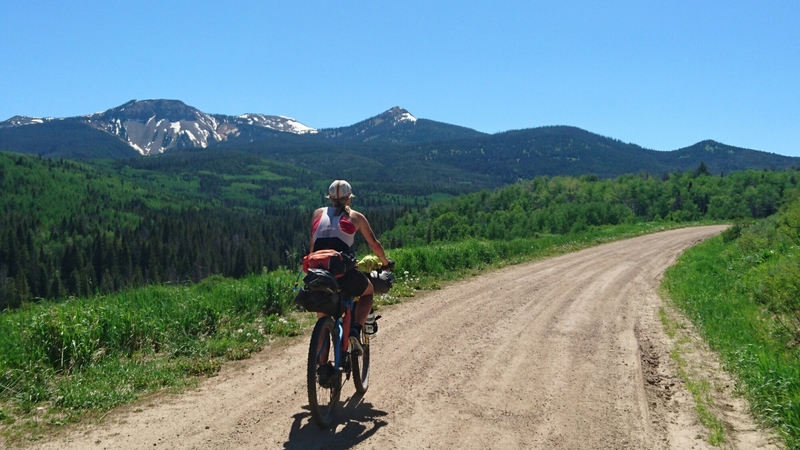 Onto the Great Basin tomorrow, hoping that wind dies down! Looking at google earth, the countryside has changed rapidly, but maybe not on a bike.! Are you wearing your HI VIS to warn those trucks? be careful. In Oz the 3 trailer long trucks keep sounding their horns to warn cyclists to get out of the way, has they take ages to stop! Your photos have not come up in this blog. Sometimes it changes totally in the space of a few minutes, other times the view doesn’t change all day… Photos now working!